My name is Gregory Mashanov. I work in the Francis Crick Institute (London, UK). My main areas of research are: single molecule imaging in live cells, modelling single molecule dynamics in live cells, writing software for scientific projects. 1962 Born in Ulan-Ude, Eastern Siberia, USSR. 1973 Moved to Chelyabinsk (Urals). 1979 Finished secondary school N106 in Chelyabinsk. 1979–1984 Full course of biology (Char of Physiology) at Urals State University, Sverdlovsk (Ekaterinburg). 1996-1999 Institute of Physiology, Urals Branch of RAS, Ekaterinburg. 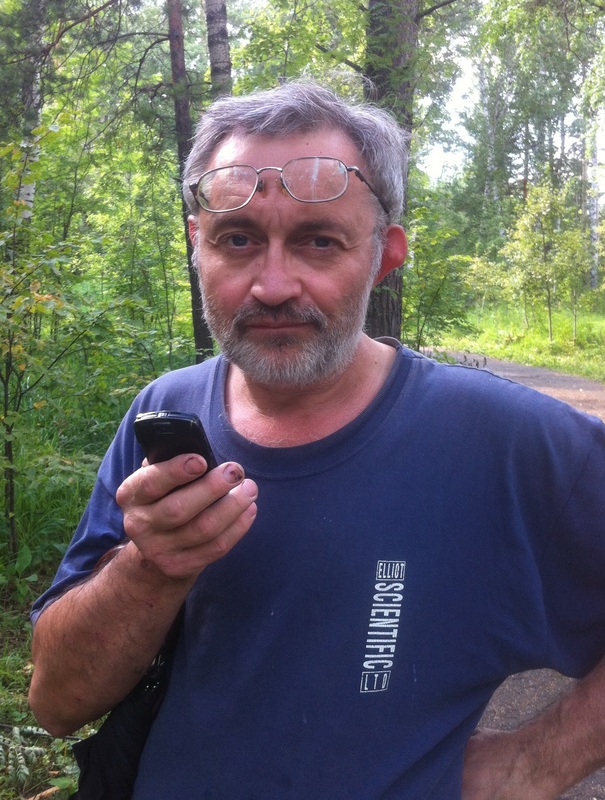 1997 PhD in Biophysics, Biology Department of Moscow State University. Baboolal T.G., Mashanov G.I., Nenasheva T.A., Peckham M., Molloy J.E., (2016) A combination of diffusion and active translocation localizes Myosin-10 to the filopodial tip, J. of Biol. Chem., 291:22373-22385. Conte I.L., Hellen N., Bierings R., Mashanov G.I., Manneville J.B., Kiskin N.I., Hannah M.J., Molloy J.E., Carter T. (2015) Interaction between MyRIP and the actin cytoscleleton regulates Weibel-Palade body trafficing and exocytosis, J. of Cell Science, 129:592-603. Conte I.L., Coolson E., Hellen N., Bierings R., Mashanov G.I., Carter T. (2015) Is there more than one way to unpack a Weibel-Palade body? Blood, 126:2165-2167. Nenasheva T.A., Neary M., Mashanov G.I., Birdsall N.J.M., Breckenridge R.A. and J.E. Molloy (2013) Abundance, Distribution, Mobility and Oligomeric State of M2 Muscarinic Acetylcholine Receptors in Live Cardiac Muscle, J. of Molecular and Cellular Cardiology, 57:129-136. Nenasheva T.A., Mashanov G.I., Peckham M, Molloy J.E. (2011) Imaging individual myosin molecules within living cells. Methods in Molecular Biology, 778:123-142. Hern J.A., Baig A.H., Mashanov G.I., Birdsall B., Corrie J.E.T., Lasareno S., Molloy J.E., Birdsall N.J.M. (2010) Formation and dissociation of M1 muscarinic receptor dimers seen by total reflection fluorescence imaging of single molecules, PNAS, 107:2693-2698. Mashanov G.I., Nenasheva T.A., Peckham M, and J.E. Molloy. (2006) Cell biochemistry studied by single-molecule imaging, Biochemical Society Transactions, 34:983-988. Nenasheva T.A., Mashanov G.I. (2006) Visualization of single fluorescent molecules in living cells (Review) Biofisika (Russia)., 51:454-465. Mashanov G.I. (1997) The cross-bridge model for an in vitro motility assay. Biofisika (Russia), 42:1113-1121 (in Russian). Bershitsky S.Y, Tsaturyan A.K, Bershitskaya O.N, Mashanov, G.I, Brown P, Burns R, Ferenczi M.A. (1997) Muscle force is generated by myosin heads stereospecifically attached to actin. Nature, 388:186-190. Mashanov G.I. (1997) The cross-bridge model for an in vitro motility assay. J. of Muscle Research and Cell Mot. 18:265. Bershitsky S.Y, Tsaturyan A.K, Bershitskaya O.N, Mashanov G.I, Dobbie I, Irving M, Torok K, Brown P, Ferenczi M.A. (1996) The mechanical and structural properties of permeabilised skeletal muscle fibers of the frog after partial EDC cross-linking. J. of Muscle Research and Cell Mot., 17:156. Bershitsky, S.Y, Tsaturyan A.K, Bershitskaya O.N, Mashanov G.I, Brown P, Webb M.R. and Ferenczi M.A. (1996) Mechanical and structural properties underlying contraction of skeletal muscle fibres after partial 1-ethyl-3[3-(dimethylamino) propyl] carbodiimide cross-linking. Biophys.J., 71:1462-1474. Mashanov G.I, Tsyvian P.B, Artemeva O.G. (1992) Early hypoxic contracture in adult and new-born rat myocardium. Physiological Journal (Kiev, Ukraine), 38:36-41 (in Russian). Mashanov G.I, Tsyvian P.B, Abazov V.A. (1990) Temperature controller for the small perfusion chambers. Physiological Journal of USSR (in Russian), 6:422-424. Tsyvian P, Mashanov G.I, Artemeva O. (1989) Early hypoxic contracture in adult and new-born rat myocardium. J. of Molecular and Cellular Cardiology, 21:60.